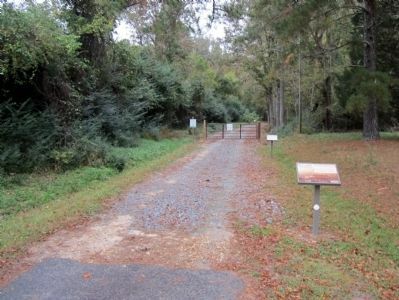 The Roanoke River, Halifax, and the Underground Railroad. 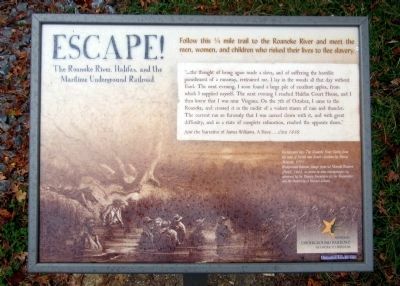 Follow this ¼ mile trail to the Roanoke River and meet the men, women, and children who risked their lives to flee slavery. “…the thought of being again made a slave, and of suffering the horrible punishment of a runaway, restrained me. I lay in the woods all day without food. The next evening, I soon found a large pile of excellent apples, from which I supplied myself. The next evening I reached Halifax Court House, and I then knew that I was near Virginia. On the 7th of October, I came to the Roanoke, and crossed it in the midst of a violent storm of rain and thunder. The current ran so furiously that I was carried down with it, and with great difficulty, and in a state of complete exhaustion, reached the opposite shore.” From the Narrative of James Williams, A Slave…, Circa 1838. Erected by National Underground Railroad Network to Freedom. when traveling north. Touch for map. Marker is in this post office area: Halifax NC 27839, United States of America. Touch for directions. Other nearby markers. At least 8 other markers are within walking distance of this marker. Halifax Runaway Ads (within shouting distance of this marker); Montfort Archaeological Museum (about 400 feet away, measured in a direct line); The Sally Billy House (about 700 feet away); Halifax Courthouse (about 800 feet away); Site of First Courthouse (about 800 feet away); The Free Church of Halifax (about 800 feet away); The Market Green (approx. 0.2 miles away); Colonial Punishment (approx. 0.2 miles away). Touch for a list and map of all markers in Halifax. More about this marker. The background is captioned, "Background top: The Roanoke River Valley from the map of North and South Carolina by Henry Mouzon, 1775." and "Background bottom: Image from Le Monde Illustre (Paris), 1862, as shown on www.slaveryimages.org. sponsored by the Virginia Foundation for the Humanities and the University of Virginia Library." More. Search the internet for Escape!. Credits. This page was last revised on June 16, 2016. This page originally submitted on October 30, 2012, by Bernard Fisher of Mechanicsville, Virginia. This page has been viewed 396 times since then and 9 times this year. Photos: 1, 2. submitted on October 30, 2012, by Bernard Fisher of Mechanicsville, Virginia.